For the last one week I have not been am feeling well; got a muscle sprain in the neck resulting in a severe back pain. It was getting better slightly; but then again I spilled on a toy my little one had thrown around in the kitchen resulting in more injury. My entire day was spent taking Tylenol and staying in the bed. Turning from one side to other was like a robot turning entire body in single stretchy motion. To add more sourness to it my hubby had go for a business lunch, so I have to take care of her, and I couldn’t even lift her as she wished at times. My Hubby always says if you are healthy then you will have the time for blog and everything, otherwise it all becomes secondary. Yes he is absolutely correct. Because of this muscle pain I ended up neglecting my blog baby. By evening I got some strength and made this easy recipe, as my little one love pineapple like crazy. I decided to make this dish, as it is one our traditional sadya recipe (means feast). It is amazing to taste various veggie curries with different tastes during a single meal. I miss those wedding feasts where traditional dishes are served. This recipe I got from a You Tube video, it is really simple and very tasty. In this, the chef pressure cooks the pineapple with little salt, yogurt, chili powder and sugar. Once it gets cooked well, he adds ground paste of coconut and green chilies. Then it is seasoned with curry leaves with halved red chili, mustard seeds and curry leaves. It tastes more on the sweet side than the spicier side. When I was a kid I am fan of this, now also I love them. Try it if you have fresh pineapple in hand, I won’t suggest to try with canned ones as it has higher sugar content. Here goes the recipe. In a pressure cooker add chopped pineapple, turmeric powder, chili powder, salt, sugar, yogurt and water and pressure cook for two whistles. It takes about 6 minutes. Switch off and set aside for cool. In the mean time grind coconut, green chili and ¼ cup water to form a soft paste and set aside. Once the steam is gone from the pressure cooker bring the pot back to heat and add ground coconut-green chili paste and few curry leaves and cook for about 8 minutes or until thick gravy consistency is reached switch off the flame and set aside. In a small pan heat coconut oil and add mustard seeds, halved red chilies and curry leaves fry them until mustard seeds starts spluttering. 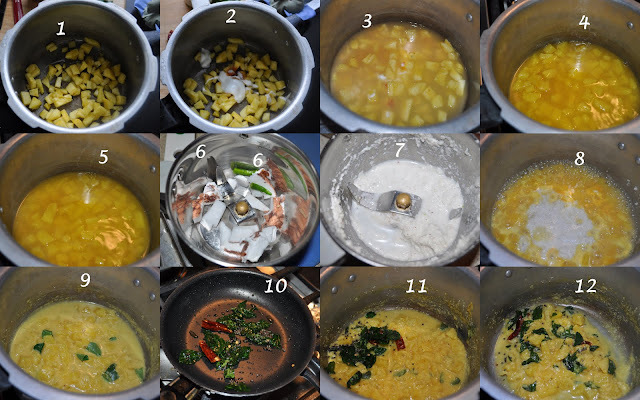 Add the entire contents to cooked pineapple mixture and mix everything to combined well. Enjoy with rice and other sides. Will you make it again: Yes I will. Adipoli pachadi,flavorful and delicious..love it. Wow that sounds great never tasted it.Will try. Pineapple pachadi looks delicious,feel better soon Swathi. Delicious Swathi, there is a Thai curry with this combo and I love it. Should taste your recipe soon. Sorry you aren’t feeling good Swathi – hope you are back to yourself soon! The pineapple looks so good – unique and delicious! Very delicious and unique looking pineapple pachadi. awesome dish! And love the pics ! It must be tangy and juicy! Delicious! You take care of yourself! Yesterday only I was searching some pineapple recipe..It looks tempting.. thanks for sharing ..
Wow pineapple curry looks super delicious,completely new for me and irresistible..
curry with pineapple is very new to me !! looks so wonderful !! I love anything with pineapple.Hope ur bread making is going on well !! Love this tangy and yummy gravy! This must taste really delicious! Like chutney, I could eat this with any meal, I’m sure! It’s simply irresistible! looks very delicious..will love to try this out.. Injuries like that are very painful. Hope you are feeling much better. My pineapples are getting there. Will all be ripening very soon and I want to try this very different type of curry. Sounds like an easy way to make something with pineapple! Hope the injuries are feeling better! Aboslutely delicious , tangy and yummy! Adipoli pachadi and loved the step by step presentation..
so sorry to hear about your injury..hope you feel better soon..this dish sounds new to me but it looks good and delicious.